Are you looking for a truly unique and comfortable place to spend time indoors or outside your home? Would you like something that will turn heads every time you have friends or family over to visit? 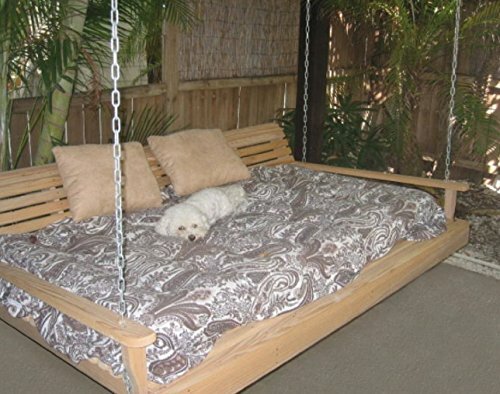 Have you ever considered installing a swinging bed for this purpose? If you’re thinking of putting up a swinging bed, you’re in luck. In this article, we’ll introduce you to five excellent beds that fit this description perfectly and are sure to make a big difference in your home in no time. But just what are swinging beds for sale, anyway? Simply put, this is a bed that is designed to swing from the ceiling. They usually double as more traditional swings, and may look a little bit like a cross between a porch swing and a daybed. This is totally dependent on the style, however, so keep in mind that there are plenty of swinging beds out there that don’t fit this description very strictly. If you can sleep in it and it hangs from the ceiling—and it isn’t a hammock!—then chances are good it’s probably a swinging bed! These are popular additions to the home that look great on porches and patios as well as in sunrooms and even in bedrooms. Choose where you want to use your swinging bed and pick your favorite from our list of quality products below to help you get started on your way to a great night’s sleep. 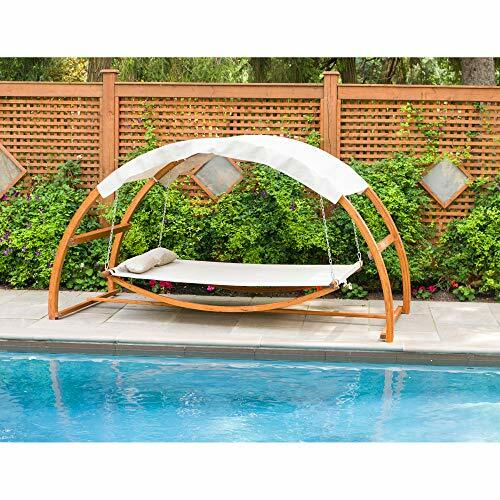 For a great, high-quality, modern style swinging bed, check out the Leisure Season Swing Bed with Canopy. This product is made of all-natural materials and comes with an optional fabric cover that can help you keep the sun out of your eyes when you want to relax in this bed in your backyard. With two included cushions, this swing is ready to go in no time. This sturdy product sleeps like a bed but hangs like a hammock with a frame for safety and comfort both. It’s easy to keep this product clean. If you keep this product in your yard, the top will need to be removed when it rains. Some customers have had some trouble with customer service from this brand. 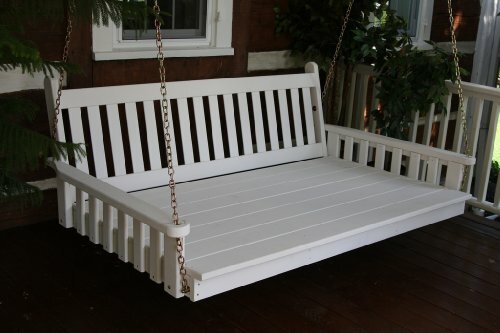 Hang the Outdoor Traditional English Swing bed on your porch or patio and you’re sure to love the lazy days of summer. This product is made of natural pine and is sturdy and durable enough to hold up to a lot of wear and tear on your porch. This durable swing is easy to hang and even easier to enjoy. The swing features a traditional design that looks great in any setting. This product is not finished or painted, so you’ll need to take care of this before you can hang it. The product is not assembled ahead of time at all. 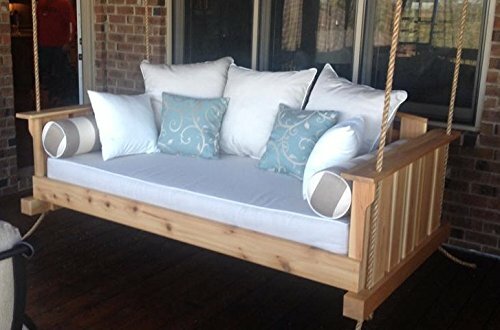 Stretch out easily in this Cypress Porch Swing Bed and enjoy the security of a swinging bed nap! This swing bed is made of cypress so that it can be easily used indoors or outside. It can hold up to 600 pounds, so you can easily share it with another person without having to worry about safety concerns. This bed comes 90% pre-assembled. The bed comes with zinc-plated hardware for maximum security. The bed does not come with a mattress or any extras. The frame for this bed is not treated or painted. Enjoy napping the day away in the Cottage Adjustable Bed Swing. This swing is easy to put together without too much effort and can be attached to your ceiling without much trouble either. You’ll love kicking back with the more modern and contemporary style of this unique, beautiful bed! This bed features a metal frame that is more durable as well as more lightweight than wooden ones. The bed comes with the chains needed to support it from the ceiling. This bed’s adjustable back may be difficult to move for some customers. The bed may not have the rustic design some customers prefer. Install the Daniel Island Swing Bed for a comfortable and beautiful way to swing your way to sleep. This bed is made of chemical-free cedar that’s great for indoor or outdoor use, and it is designed to fit a standard twin mattress with no trouble. This swing bed can hold up to 1000 pounds, depending on the way you hang it form your ceiling. The swing comes with a very durable rope designed specifically for use with this product. The swing doesn’t come with a mattress or any pillows, so this will be an added expense. You may need to treat or paint the bed frame. What do you think? Are you ready to make the upgrade to a swinging bed? Keep in mind that a swinging bed isn’t for everyone, and even if you decide it’s not right for your bedroom, you may choose to put one in place for a more temporary napping option on the porch, patio, lanai, or in the sunroom. 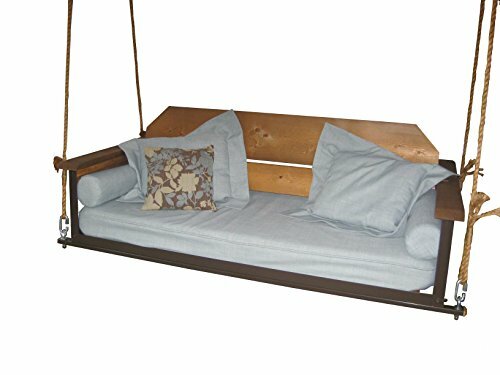 The end result is entirely up to you, but if you want something that will make a unique statement in your home, you can’t go wrong with a swinging bed. Always make sure the bed is secured to beams that are sturdy enough to hold it as well as the weight of anyone who might be sleeping in it. Always hang your swinging bed close enough to the ground that anyone sleeping in it will be okay if they fall out. This means putting it even lower if you’re using this product for a child. If you’re using your swinging bed for a child or even if you just have little ones present in your home, you may want to cover the chains with rubber or with some other type of product to prevent little fingers from getting potentially crushed. There are a lot of other safety concerns to keep in mind when using a hanging bed, either as a temporary napping station or a more permanent place to sleep every night. Make sure you follow all the safety precautions specified in the instruction manual that comes with your hanging bed, and be sure to look up information about these types of beds to get ahead of any problems that may arise from using one. With the right commitment to safety, you’ll have a great time sleeping in your swing bed.